Ian Morris is the author of the new novel Simple Machines. 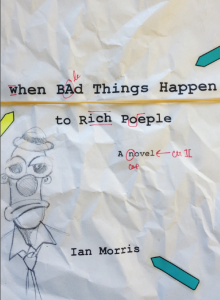 He also has written the novel When Bad Things Happen to Rich People and co-edited The Little Magazine in Contemporary America. 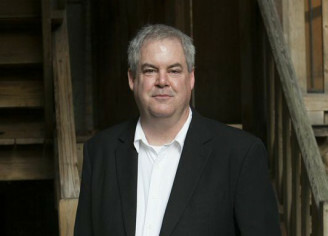 His work has appeared in various publications, including Crab Orchard Review and Creative Nonfiction. He is the managing editor of the magazine Punctuate, and he lives in Chicago. 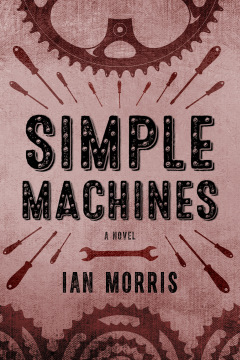 Q: How did you come up with the idea for Simple Machines, and for your main character, Tomas? 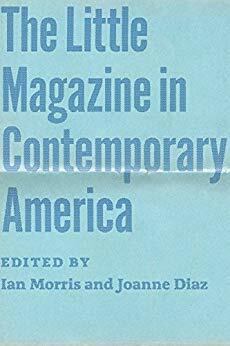 A: The idea of the book came out of a combination of factors. My father ran a bike store, and I have been riding a bike a lot since I was 5. I had written nonfiction pieces about bicycles but, for some reason, not fiction. When I conceived of the book, I happened to be reading a lot about people-powered flying machines. The most successful of these actually flew from Crete to the Greek mainland and was named Icarus. That got me thinking about that myth. I learned that Daedalus was the carpenter to the Gods until he betrayed King Minos and was exiled to the labyrinth of Crete. So, the idea of a father and son who were laborers and exiled to an island was flying around in my mind you could say. As for the character of Tomas, he was born out a desire to explore my relationship with my father. He was in no way abusive, but he did drink a lot when I was younger, which made his moods somewhat tricky to navigate. From when I was around 10 years old, I spent most of my free time down at the shop, and I began working there when I was 13, so we were around each other a lot. Plus, we often rode together, as do Tomas and Ernst in the book. I’m sure there were a lot of times when he was glad I was there and times when he wished I wasn’t. There’s a lot of good and bad that comes when a father teaches a trade to his son. Q: The novel is set in Wisconsin. How important is setting to you in your writing? A: Setting is very important. I was born in upstate New York, and we moved to Wisconsin when I was 5 where I was viewed as an outsider. I quickly assimilated, as kids do, and came to view myself and my fellow Wisconsonites as typical of the American existence. It wasn’t until I moved to Arkansas for graduate school that I realized how distinctive the people I grew up with were in their speech and pastimes, and, for the first time, I started to think about what it meant to live in a northern climate and culture. I knew I wanted to write a novel that was set in the north. A: That’s a really interesting question. Because the novel is partially based on the myth of Icarus and Daedelus, I knew how the story would end in a structural sense. In fact, I lost a very good agent because she thought the ending was too sad and wanted me to brighten it up a little, which I couldn’t do. However, everything that happens when Tomas is away at college was spontaneous invention at the time I wrote it. It’s always nice to be surprised by your own imagination. A: Simple machines are a class of objects, including the wheel, the lever, the wedge, and the inclined plane—the earliest tools devised by the human mind. A friend of mine once told she was going to do her PhD thesis on the “Theme of Construction in the Works of Ian Morris” because people who build things or make things with their hands are overrepresented in my writing. I came to think about the idea that the forces that influence us and move about world might be not so much divine as practical. A: Oh, thank you for asking. I’m writing a novel about a stand-up comic set in the Catskill resorts of the 1960s that culminates in an obscenity trial. As I was researching the comics of the era, and I was amazed had how offensive a lot of their material was. We think of Lenny Bruce as hero of free speech, but we would find most of what even his less edgy fellow comics were doing back then unutterable today, so the project has become a reflection on the fall of white privilege. A: Let’s see. I’m going to be writing a blog in conjunction with the 50th anniversary of the Woodstock festival, starting in February when then the organizers first met and ending in August when it was staged. My interest in the festival sprung out of research I was doing into the Catskills and my experience growing up in Madison, Wisconsin, which was heavily influenced by ‘60s counter-culture. Thank you for these great questions. I really enjoyed talking about Simple Machines.